[140 Pages Report] AI in Oil and Gas Market was USD 1.42 Billion in 2016 and is expected to grow at a CAGR of 12.66% from 2017 to 2022 to reach a market size of USD 2.85 Billion by 2022. This research study involved the use of extensive secondary sources, directories, and databases, such as Hoover’s, Bloomberg Businessweek, Factiva, and OneSource, to identify and collect information useful for a technical, market-oriented, and commercial study of AI in Oil and Gas Market. Primary sources are mainly industry experts from the core and related industries, preferred suppliers, manufacturers, distributors, service providers, technology developers, standards and certification organizations of companies, and organizations related to all the segments of this industry’s value chain. The research methodology has been explained below. After arriving at the overall market size, the total market has been split into segments and sub-segments. The figure given above illustrates the breakdown of primaries conducted during the research study on the basis of company type, designation, and region. 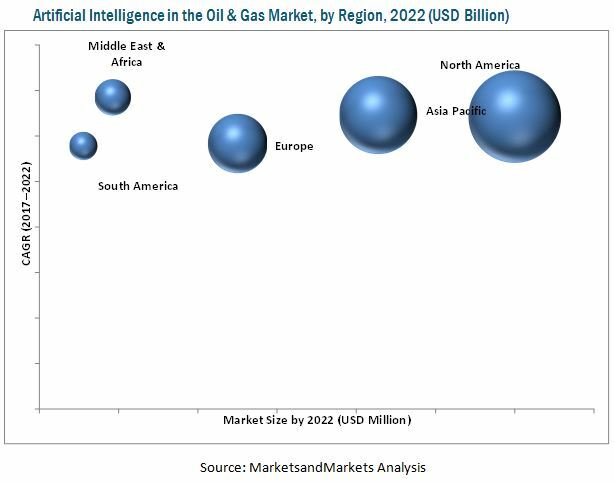 AI in the oil & gas market ecosystem comprises service providers such as IBM (US), Intel (US), Microsoft (US), Accenture (Republic of Ireland), Google (US), Microsoft (US), Oracle (US), Numenta (US), Sentient technologies (US), Inbenta (US), General Vision (US), Cisco (US), FuGenX Technologies (US), Infosys (India), Hortonworks (US), and Royal Dutch Shell (Netherlands). AI in Oil and Gas Market has been segmented as follows. The global AI in Oil & Gas market is expected to grow at a CAGR of 12.66%, from 2017 to 2022, to reach a projected USD 2.85 Billion by 2022. The growth will be mainly driven by the rise in adoption of the big data technology, digitalization of the Oil & Gas industry, investments in AI-related start-ups, and rising pressure to reduce production costs and increase efficiency. The report segments AI in the Oil & Gas market, on the basis of type, into hardware, software, and services. The software segment led AI in the Oil & Gas market in 2016. Software in AI in the Oil & Gas market are applicable in upstream Oil & Gas exploration and production activities. The hardware segment in AI in the Oil & Gas market is expected to grow swiftly during the forecast period (2017 to 2022), mainly due to the increasing requirement for sophisticated hardware system configurations and components capable of handling massive data, including, but not limited to Tensor Processor Unit (TPU), Graphic Processing Unit (GPU), Resistive Processing Unit (RPU), Field Programmable Gate Array (FPGA), and Visual Processing Unit (VPU) to install software-based AI capabilities. AI in the Oil & Gas market, by function, is segmented into predictive maintenance and machinery inspection, material movement, production planning, field services, quality control, and reclamation. Preventive maintenance is the largest and one of the fastest growing segment in AI in the Oil & Gas market. Predictive maintenance aids in addressing costly downturn, by predicting maintenance schedules for equipment to prevent the possibility of equipment failures and, thus, save millions of dollars. The report further segments AI in the Oil & Gas market, by application into upstream, midstream, and downstream. The upstream segment of AI in the Oil & Gas market is expected to account for the largest market size and grow at the highest CAGR during the forecast period. North America is projected to be the largest market for AI in the Oil & Gas market due to increasing adoption of AI technologies by oilfield operators and service providers and the strong presence of prominent AI software and system suppliers, especially in the US and Canada. The Middle East and Africa is the fastest growing market due to increasing investments in start-ups for AI implementation, which would further raise the demand for AI in the near future. The major factor restraining the growth of AI in the Oil & Gas market is the ambiguous regulatory guidelines for AI in the Oil & Gas market. Some of the global players in this market include IBM (US), Accenture (Republic of Ireland), Google (US), Microsoft Corporation (US), and Oracle (US). Together they hold a strong share of the global AI in the Oil & Gas market.